While I enjoyed every aspect of Idlewild that I included in my book, one of the most compelling, challenging and fascinating subjects I researched was the history of merry-go-rounds and carousels at the park. This is the first of a series of blog posts that I hope will create a comprehensive history of this beloved attraction at Idlewild and highlight the sources that I used. This is a work in progress and my posts will be updated as more information is discovered over time. Please feel free to contact me if you have any useful sources – newspaper articles, pamphlets, company records, photographs – that can add to my research. Thank you! Idlewild’s current carousel, Philadelphia Toboggan Company No. 83, is the park’s longest resident carousel and has remained in this same location at the park since it came there in 1931. 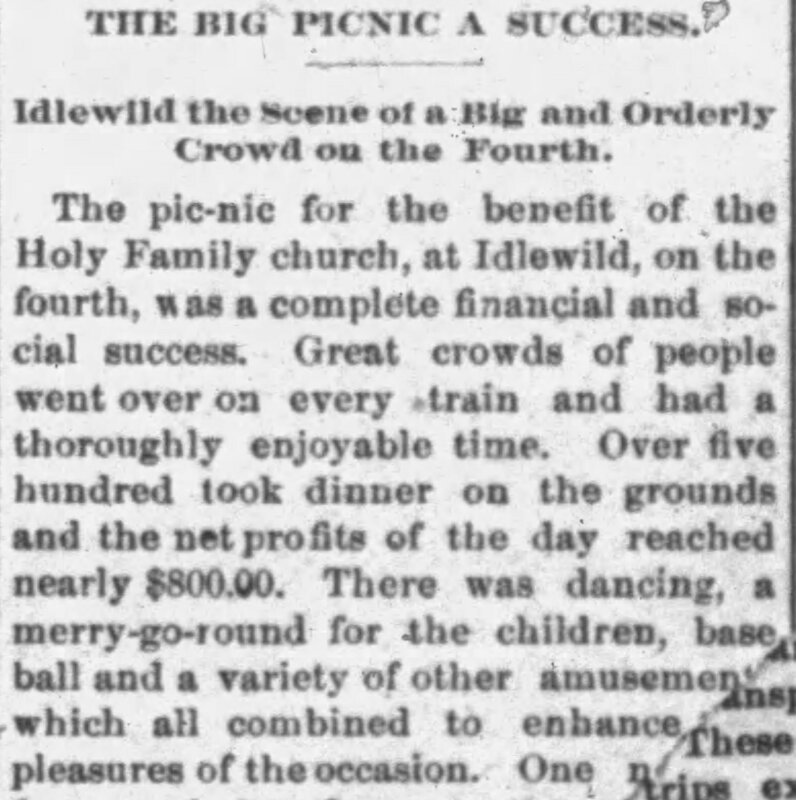 However, Idlewild’s history with merry-go-round attractions stretches back to the park’s early days as a 19th century picnic grove. 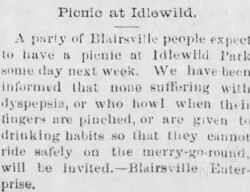 The earliest report of a merry-go-round operating at Idlewild dates back to 1889, although without few details or corroborating sources. 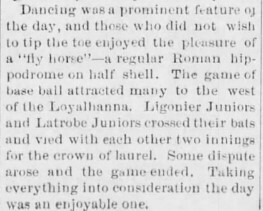 The first reference to this amusement device I found appeared in the July 10, 1889 issue of The Ligonier Echo. A “fly horse” was reported at the park during the Fourth of July celebration that year. 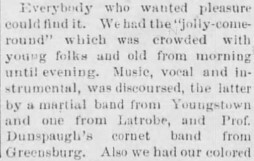 Later that summer, a local doctor enjoyed the “jolly-come-round” at the annual Lutheran Harvest Home Picnic on August 8, 1889, according to two articles in the August 14, 1889 issue of The Ligonier Echo. Here’s where it gets interesting. 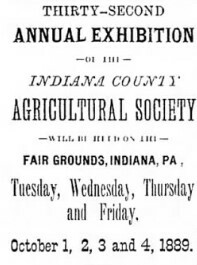 The proprietor of the Idlewild merry-go-round may have loaned the concession out for the 32nd Annual Exhibition of the Indiana County Agricultural Society held at the Indiana County Fairgrounds from October 1-4, 1889. The September 18, 1889 issue of The Indiana Progress and the September 19, 1889 issue of The Indiana Democrat both described the “large flying machine which will be brought to the fair from Idlewild Park” in detail, including the number of horses (24), the fact that it also had an unknown number of carriages, the fact that it had some sort of music system, its mode of operation (steam-powered), its size (40 feet in diameter), and its value and fare (machine valued at $3,000, patrons charged 5 cents per ride). It does not specify a manufacturer, however. 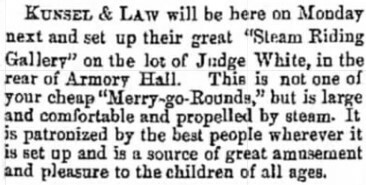 The September 18, 1889 issue of The Indiana Weekly Messenger mentions Kunsel & Law as the proprietor of a “Steam Riding Gallery” to be soon set up on the lot of Judge White behind Armory Hall. 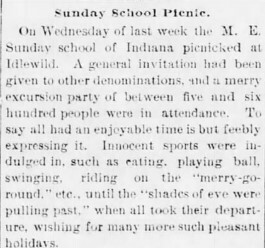 If this device is the same as the one reported by the other Indiana newspaper to be brought to the fair from Idlewild Park, then we can deduce that Kunsel & Law is the earliest known proprietor of a merry-go-round at Idlewild Park. However, only one reference to this proprietor and one reference to the merry-go-round coming from Idlewild have been found and still no mention of a manufacturer. Unfortunately, there is little detail given in these accounts, save the Indiana papers, about who built these early merry-go-rounds, how big they were, how many horses they had, how they were powered (steam, mule), the materials they were made from, their paint colors if any, their carving styles, where they were set up at the park, etc. We do not have any corroborating sources for the claim that an Idlewild merry-go-round was loaned for the 1889 Indiana fair, so we can’t be 100% that the description of the device at the fair applied to Idlewild’s. Was the jolly-come-round/merry-go-round at Idlewild reported at picnics in 1889 the same flying jinny/merry-go-round reported at picnics in 1890 or from a different proprietor? There are no surviving Ligonier Valley Rail Road or Idlewild Park records from this period that can help answer these questions, unfortunately. No photographs have yet come to light, either. YET is the key word, says this eternal optimist.